Dear Danielle: Where Do I Get Stock Images for My Blog Posts? Oh, man, there are a ZILLION stock image vendors to choose from (free and paid). You can spend an equal number of hours trying to look at them all, too, lol. There isn’t any one in particular I recommend. When it comes to choosing stock images, so much of it is subjective and based on personal preference. I personally tend to get a lot from iStockPhoto.com because I’ve been using them for years and I prefer not to spend tons of time trying to hunt down the “perfect” image. They definitely aren’t free, though. That said, they are one of the lesser expensive of the professional grade stock image sites. If you go to my Pinterest page and go to the board Biz: Design — Stock Images, you’ll find a bunch of stock image resources I’ve pinned, many of which are free. PS: Be sure and check out all my other Biz Boards on Pinterest, too, which are chock-full of useful business information, tool and resources for Administrative Consultants. What do you think? Leave a comment! Posted in Blogging. Bookmark the permalink. 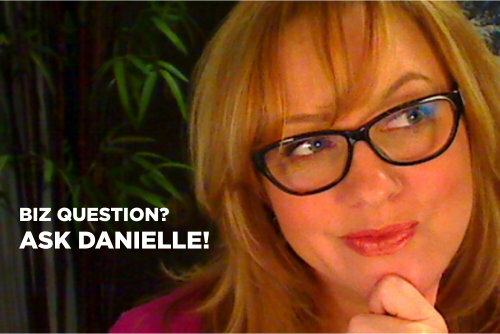 Dear Danielle: Should I Delegate My Blog Commenting? Personally, I think it’s something you should handle yourself. I know there are “experts” out there who say you should respond to every comment and to delegate if you need to so that you can. Hey, it’s their blog. That’s up to them. To me, though, if a blog has an actual person behind it and it’s intended to connect with people, even if it’s still for business, then that blog author’s interests as well as those of his or her readers’ will be better served if the responses to comments are made by the blog author. You can’t delegate personality, authenticity or your unique charm and perspective. And the thing is, if you have people who support you in other areas of your business, that should be freeing up your time so that you have more of it to respond personally on your own blog. Some things aren’t meant to be systemized or automated or delegated. My philosohpy is to just be a person. Not a robot. Not a faceless, nameless corporate machine. Plus, not all comments require a response. Sometimes they do, sometimes they don’t. When people respond to literally every comment, it becomes a bit of a cartoon, the back-and-forth one where they’re going, “Thank you.” “No, thank you.” “No, thank YOU.” “NO, thank YOU!” And on and on ad nauseum, lol. I don’t do anything because I’m supposed to. I do it because it feels natural and makes sense. When I comment on someone else’s blog, I don’t necessarily expect a reply unless, for example, I’ve asked a specific question. A lot of times comments are just statements. Not every comment requires a direct response. I think most smart people get that. And sometimes all a comment requires is a little smiley face of acknowledgement. But, of course, if they’ve asked a question or you can clearly see there’s more to say or that they want acknowledgement, then you definitely want to reply. Of course, it can be easy to forget to respond so what I do is put the emailed comment notification in my daily online tickler folders so that I have a reminder. My thinking is, don’t stress over being fomulaic in your approach. Just be a person. Reply and add to the conversation when and where it makes sense and you’ll be seen as a real person with something to say who offers genuine—not artificial, canned or forced—interaction and conversation. 13 Comments Posted in Best Communication Policies, Blogging, Dear Danielle. Bookmark the permalink. There are so many things to consider in starting or re-starting a business, as I’m sure you know. At this point, there are so many different marketing avenues to promote our business and the industry as a whole. Let me tell you, I am so excited about this up and coming ‘virtual’ profession. Do you have any suggestions on how to overcome this writer’s block or how to research what topics would be interesting to my peers and potential customers? My first bit of clarity for you is to stop thinking you need to write for your peers and the industry. You are wasting your business building time and energy. I can’t tell you how many people I see and mentor who complain about not having clients and needing to get more clients–and then waste all their time and energy talking to and blogging for each other instead of their would-be clients! You may have heard the phrase “wasted real estate” when experts talk about how business owners waste valuable website space with content that has nothing to do with anything when it comes to attracting clients and being of interest to them. In the same way, you don’t need to be writing for your peers or for the industry. They are not your clients. If that’s what you’re doing, you’re wasting one of your most valuable pieces of marketing and networking “real estate.” If you are starting your business or trying to grow it and attract more clients and be of service to them, write your blog for them. And my second bit of advice for getting over writer’s block is to get a target market. Of course you will be at a loss as to what to write about when you don’t know who you are talking to. When you try to write for anyone and everyone, you end up being interesting to no one. This is yet another way having a target market helps you: it gives you clarity, focus and direction. When you know who you are talking to, it’s easier to know or figure out what is going to be of value, use and interest to them. And this is what will help make your content far more interesting, useful and compelling. Make sure you have several ways for your target market to subscribe to your blog. First and foremost, use a service like Aweber which will help you build your list and automate the distribution of new post notifications to these subscribers. Make the subscription form your most prominent feature in your upper right sidebar (“above the fold”). There will be people who prefer to subscribe by RSS or with things like Networked Blogs. Give them those options as well. However, if you are interested in building your list, you may want to feature those options less prominently. Give your blog a title and/or tag line so that your target market knows instantly that your blog is especially for them. Survey your subscribers periodically. Pick their brains. Ask them questions. Your blog isn’t just a way to connect with clients. It can also be an excellent research tool for getting to know them better and find out more about what their challenges and common goals and interests are in business–which is going to help you in your business and offerings to them as well as knowing what to write about for them. 2 Comments Posted in Blogging, Dear Danielle, Demonstrating Your Expertise, Establishing Rapport, Getting Clients, Marketing, Positioning, Relationships, Starting Your Biz, Trust and Credibility. Bookmark the permalink.